Sally English, Associate Broker at Realty Associates of Atlanta LLC, listed 3961 Briaridge Circle Atlanta GA 30340. Call or text Sally English direct at 404-229-2995 for more information about this home. Walk or bike to Northumberland Swimming Pool from this spacious split level home. New carpet on lower level including family (with brick fireplace), Bedroom 4 (doubles as a rec room), full bath #3, Laundry Room and Sunroom. Main level includes living room, dining room and renovated kitchen – all with hardwood floors. Upper level has the master bedroom suite, two additional spacious bedrooms all with hardwood floors and a hall bath. Fenced backyard with storage building. Evansdale Elementary (STEM) and Lakeside HS. Easy commute to Emory, CDC, CHOA. 4 BRs, 3 full baths. Convenient commute to Emory, CDC, VA, Midtown, IRS, FEMA, Mercer and new CHOA. Nearby Henderson Park has walking trails, fishing lake, playground, tennis courts, community garden and soccer fields. MAIN FLOOR features the entrance foyer, formal living and dining rooms and renovated kitchen. Hardwood floors throughout main level. ENTRANCE FOYER features hardwood floors, coat closet, steps up to bedroom level and cased opening to living room. FORMAL LIVING has hardwood floors, two large windows, chandelier. Cased opening to foyer and to dining room. Used as dining room by current owner. FORMAL DINING ROOM has hardwood floors, double window, chandelier, door to kitchen. Used as breakfast room by current owner. RENOVATED KITCHEN features stain finish cabinets, granite countertops, hardwood floors, double-bowl stainless-steel under-counter sink with garbage disposal. Ceiling fan and light. Door to backyard. PREMIUM APPLIANCES include a Frigidaire stainless-steel finish range with smooth cooktop, Samsung stainless steel finish microwave/ventahood combination, stainless steel finish dishwasher. LOWER LEVEL has a family room, Sunroom, Bedroom #4, Full bath and Laundry Room. New carpet (May 2018) throughout lower level. FAMILY ROOM features new carpet, brick fireplace with brick mantle, double French doors to sunroom. SUNROOM has three walls of windows and overlooks fenced backyard. New carpet. French door to backyard. BEDROOM #4 has new carpet, closet and two windows. Would also make a great REC ROOM. RENOVATED FULL BATH has a ceramic tile floor, walk-in shower with ceramic tile floor/walls and edgeless glass doors. Stain finish vanity cabinet with ceramic vanity sink. Window. LAUNDRY ROOM off hall to bath has washer and dryer connections. UPPER BEDROOM LEVEL includes 3 bedrooms, 2 baths. HARDWOOD FLOORS throughout upper bedroom level. MASTER BEDROOM is spacious. Hardwood floors. Double door closet. Two windows. Ceiling fan and light. RENOVATED MASTER BATH has a ceramic tile floor, walk-in shower with ceramic tile floor and walls. Window. White vanity cabinet and sink. BEDROOM #3 feature hardwood floors and a double window. HALL BATH has a ceramic tile floor, white vanity cabinet, tub-shower combination. FRONT PORCH is perfect for hanging baskets. TWO CAR CARPORT has storage room. FENCED BACKYARD has a large grassed lawn, storage building and spacious patio. The Evansdale Magnet Program is available to students in kindergarten through fifth grade who have an interest or aptitude in mathematics, science, or French. Evansdale is concerned with the development of well-rounded students. The school recognizes the necessity of combining resources in this endeavor and offers varied learning strategies for the students, as well as specialized services to meet individual needs. Unique Assets: Students enrolled in Evansdale School benefit from the unique aspects of the school. A science lab is available through the magnet school for all students. Computer workstations for students are a part of each classroom. All students and teachers have access to a computer lab. Art, music, and physical education teachers provide instruction to all students. The Leon Sims Nature Center is a part of the school campus and provides opportunities for outdoor educational programs. After-school activities for students include a drama club, chess club, and student council. I-85 North to Chamblee-Tucker Rd. Right on Chamblee-Tucker Rd to right on Mercer Drive. Right on Henderson Mill Rd. Left on Evans Road. Right on Greenrock Trail. 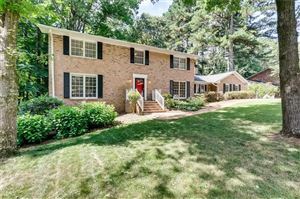 Call or text Sally English 404-229-2995 for easy showings. Sally English and the English Team specialize in homes and neighborhoods convenient to Emory University, The Centers for Disease Control CDC and CHOA. See our website at englishteam.com for great home buying advice.